So my commute from work ranges from 45 minutes to 2 and a half hours. During these 2.5 hour commutes, I will occasionally stroll on into a bar to wet my proverbial whistle. So me and my pal go into this log cabin bar outside of the Chicago city limits and it had an abnormally large selection of Polish beers. 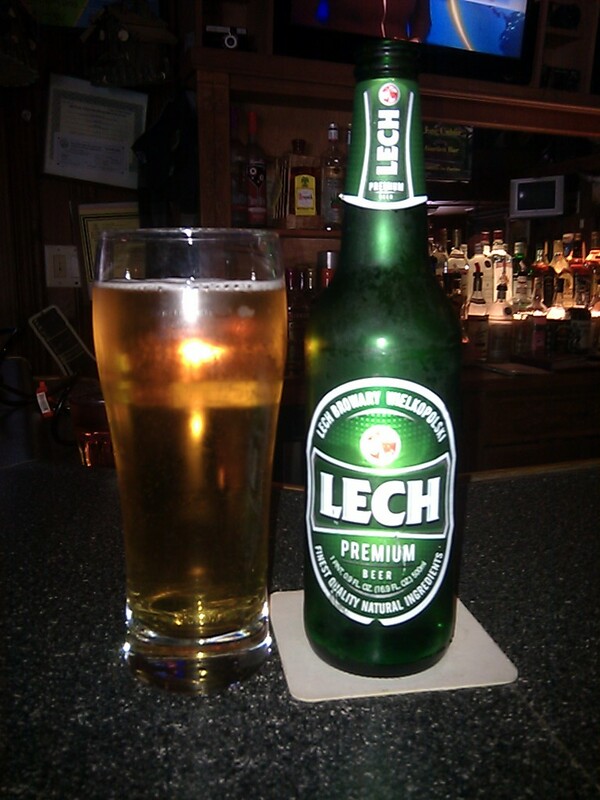 Lech is actually owned by SABMiller, which you might know from Miller Genuine Draft. Those guys actually own a ton of beers that I'm not going to get into. The plant itself was erected (insert joke) [insert additional joke] in the late 1970s. They made beer there, go figure, and Miller bought them out in the mid 90's when everyone was rocking out to Evil Empire; remember that album? Poles are known for their booze consumption, so it wasn't a coincidence that in 2007, they made the worlds largest beer mug inside of the brewery. It held 4250 liters of beer and 10,625 people enjoyed it. Obviously, my invitation got lost in the mail. Kompania Piwowarska itself translates to "Brewing Company" controls 45% of the Polish beer market, the largest being Tyskie. The thing about polish beers are some of them are great. Some of them taste like Slip and Slide water from Daniel Stern's birthday party. This is the good one (though they both sound pretty good when you put it like that). It has a similar taste to Lomza. It has a nice clear look to it, as most pale lagers do. It is complimented by a flowery, crisp flavor with a sharp finish. This may be a bold statement, but it also smells like beer. I feel this is a great beer to slam when you are watching sports at a bar because you can drink a hell of a lot of them and it comes in half liter bottles that any fool knows can knock out any hooligan. It's got such a light taste also, that if you don't knock out that hooligan, you can certainly outrun him. I paid $5 for this 500mL rascal and it has an ABV of 5.2% which is nothing to bite your thumb at. This is one of my favorite Polish beers and would definitely get it again. The worst thing I could say is the label is not nearly as appealing as Lomza. Becks called; they want their label back.